When 74-year old Francine Swinson enrolled in a financial coaching program with nonprofit Guidewell Financial Solutions (also known as Consumer Credit Counseling Service of Maryland and Delaware, Inc.) she conquered challenges to reach her goals. Her success personifies this year’s Older Americans Month theme: blaze a trail. A nonprofit with nearly 50 years service in the community. By celebrating Older Americans, the month of May offers us the chance to reflect on the unique knowledge and contributions of our seniors. This years’ theme, “Blaze a Trail,” deftly describes 74-year old Francine Swinson, who spent the past 12 months on her own personal financial journey. Her story began when she enrolled in the financial coaching program at nonprofit Guidewell Financial Solutions (also known as Consumer Credit Counseling Service of Maryland and Delaware, Inc.) in early 2015. Entering financial coaching, Mrs. Swinson’s primary goal was to restore her credit so she could qualify to buy a new home. After her initial financial assessment was completed, she began tracking her finances, so she could see where her money was going. Her coach helped her set up and stick to a budget. As she became more financially confident and secure, her coach recommended that she apply for a single credit card, so she could begin to rebuild her credit. Throughout the program, Mrs. Swinson continued to face financial obstacles. She struggled to repay her grandson’s student loan debt. Although it took a significant bite out of her budget, she regularly covered what she owed. “At times, I got discouraged,” she admits. “When I felt like giving up, it really helped having a coach who would listen and lend support.” This encouragement helped her persevere, and ultimately she received a reprieve when she qualified for loan forgiveness under a new law. With her credit on the mend, Mrs. Swinson still had one personal challenge to overcome: to avoid future problems, she had to set financial boundaries with her family. When Mrs. Swinson came to Guidewell Financial for her final coaching appointment this past month, she received a surprise: First Wilson gave her a certificate and a hug. Then she received a round of applause from the staff. She deserved every clap. 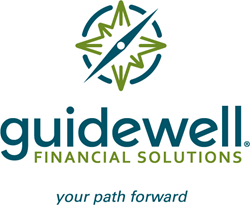 For information about Guidewell Financial Solutions’ programs and services, please visit guidewellfs.org. For a financial coaching appointment contact Pam Wilson at 1-800-642-2227 X 2053 or pwilson(at)guidewellfs(dot)org. Please feel free to share this article.PDF copy of release.